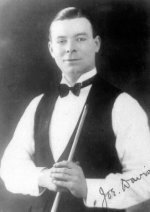 Joseph Davis, OBE (15 April 1901 – 10 July 1978) was an English professional snooker and English billiards player. He was the dominant figure in snooker from the 1920s to the 1950s. He won the first 15 World Championships from 1927 to 1946. Having won fifteen World Championship titles, spanning an unbeaten 20-year period, and losing off level terms only four times in his career - all of which came towards the end of his career and were inflicted by his brother Fred, Davis is widely perceived as one of the greatest players of all time by enthusiasts and fellow professionals, including five-time World Champion Ronnie O'Sullivan. ^ a b Turner, Chris. "Player Profile – Joe Davis OBE". Chris Turner's Snooker Archive. Archived from the original on 10 May 2012. Retrieved 15 June 2011. ^ a b "Betfred.com World Championship – History". World Snooker. World Professional Billiards and Snooker Association. 2 March 2011. Retrieved 14 November 2011. ^ "Snooker Gold Cup won by Davis". Morning Bulletin. 21 December 1936. Retrieved 17 October 2012. ^ Hayton, Eric (2004). The CueSport Book of Professional Snooker. Suffolk: Rose Villa Publications. p. 4. ISBN 978-0-9548549-0-4. Davis, Joe (1976). The Breaks Came My Way – Autobiography. W. H. Allen. ISBN 0-491-01686-7. Retrieved 9 September 2009. This page is based on the Wikipedia article Joe Davis; it is used under the Creative Commons Attribution-ShareAlike 3.0 Unported License (CC-BY-SA). You may redistribute it, verbatim or modified, providing that you comply with the terms of the CC-BY-SA.